The Traditional Service has an advantage in that it is the easiest to arrange, as it follows a pattern so families know what to expect. A traditional funeral makes many of your choices easier because there is an established etiquette for the different stages of the ceremony. The full extent of our efforts in your behalf is determined altogether by your needs and wishes. We place at your disposal- to use as you wish- the services of a courteous, experienced organization and all the comforts and conveniences of our establishment. Cremation can be arranged for the convenience of the families. We have designed services to assist you and your family when planning the final disposition of the cremation. Pre Planning or Pre-Arrangement is the process of making plans for your own funeral- or that of a loved one- well in advance of the need. Funeral pre-planning includes writing out and setting up a permanent record of your wishes. This documenting of your wishes as to the type of service, burial location and other details are very important, along with your written record of vital information that might be needed by your family at the time of your death. Many people also choose to pay for their funeral in advance. This is referred to as Pre-arrangement. You and your family can benefit when funeral arrangements are made in advance of need. This ensures that those left behind to make decisions concerning your wishes are able to plan the funeral relieving them of many of the decisions that need to be made. Our funeral planning staff are more than qualified to meet with you regarding this service. For more information and to speak with one of our knowledgeable staff, we invite you to call us to make an appointment at your convenience or complete the Contact Us form and we will contact you. 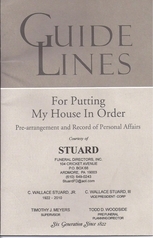 Additionally, we offer our complimentary booklet Guide Lines: For Putting My House In Order, a valuable resource that can be used to record biographical information in advance. The Guide can then be stored away with other personal documents. Copyright 2017 Stuard Funeral Directors, Inc.